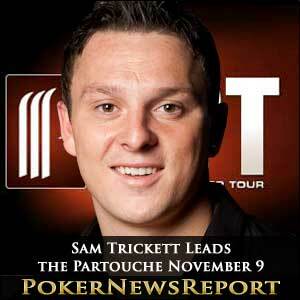 A remarkable day´s play on Saturday saw Sam Trickett take command of the Partouche Poker Tour in Cannes. With only nine players now remaining in the event, Sam leads the tournament with 2,605,000 chips ahead of Alexandre Coussy (2,473,000) and Fouad Behbehani (2,446,000), and when play recommences at the Palm Beach Casino on November 12, he is guaranteed a minimum cash of €100,000 with the target prize a cool €1 million. Sam started the day on 512,000 chips and began in the best possible fashion by winning an AA v KK race. He used his much improved stack to boss several of the pots against short-stacked opponents and busted a J8 shove with his AK to get above 2 million chips. According to his posts on Twitter, the only “downer” on the day was the elimination of compatriot Ben Vinson, who finished in 17th for a €30,000 – Ben´s biggest pickup since final tabling the GUKPT Blackpool in 2009. Phil Hellmuth was also active on Twitter throughout Saturday evening and Sunday morning. Describing Sam´s knowledge of No Limit Hold´em tournaments as impressive, the aging eleven times WSOP bracelet winner went partying into the night with Sam and other UK poker players, Jake Cody, Andrew Feldman and James Bord, as the whole of the Partouche field (or so it seemed) hit the town to celebrate Jean-Robert Bellande´s birthday. The old-timer also showed “the kids” (his words) a few things about getting up in the morning, when rising early for a game of golf against Patrick Partouche. One major problem for Sam when he returns to the table in November, is the presence to his immediate left of Oleksii Kovalchuk. The Ukrainian had another roller-coaster of a day – starting the day in 4th with 1.6 million chips, getting to the top of the leaderboard with some outrageous betting, and then losing a big slice of his stack towards the end of the day. Oleksii will begin the final table in seventh, with just 16,000 more chips than he started with on Saturday, but having to potential to upset many of the players in front of him around the table.